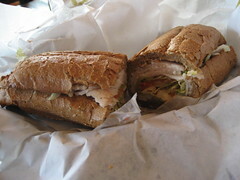 Potbelly's is a Chicago institution. Some go for the sandwiches, some for the shakes. Me? I like the pickles. 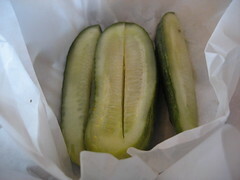 For $0.99, you get a giant pickle sliced into 4 wedges, perfect for sharing. It's crisp and fresh, and it actually retains some of its cucumber taste. It is the perfect foil for one of the hot, melty subs the place is known for. Recently, though, the restaurant began serving salads as well at all of their Chicagoland locations. They've simply deconstructed some of their most popular sandwiches, such as the Wreck and the Chicken Salad, by removing the bread and spreading the fillings on a bed of lettuce. The salads cost over a dollar more than the sandwiches, but you do get a couple extras, such as artichoke hearts and dried cranberries, depending on the salad. For now, I'll stick to my favorite sandwich, though: turkey and swiss on wheat with lettuce, tomato, mustard and hot peppers. For under $4 (well, just under $5 with the pickle), it's a deal that's hard to beat.